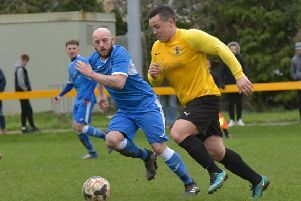 Leamington manager Paul Holleran was delighted to see his side clinch National League North survival on their own terms despite admitting it was an outcome he could not envisage 24 hours earlier. A hard-fought 2-0 win at home to Chorley last Thursday put survival within touching distance but with the trip to York following two days later, Holleran was unsure his squad would have the resilience to grind out another result. However, while the results in other games meant Brakes were safe no matter what the outcome at Bootham Crescent, an injury-time equaliser from Matt Dodd gave the survival celebrations extra fervour. “All three Thursday games we really went for it, we didn’t rest players and the Chorley win was a massive game,” said Holleran. “I don’t think we’ve had as brutal game as that all season. “I was delighted we stood up to them. They’re physically strong and I couldn’t see on Friday how we could go again. “We made a couple of changes and when I got on the coach at Coventry there was a buzz that I hadn’t felt for a while. “We were so focused to get 100 per cent over the line and the day was up and down like a yo-yo. “We were ahead. York were ahead, Gainsborough were 2-0 up, Telford were leading 3-1. It looked like it could go to the final game and be a week from hell. “Within ten minutes, Chorley were back in the game but for us to respond from York getting a late goal...losing 2-1 at York wouldn’t have been a disaster. “It was a great feeling to get the equaliser. It felt like we had got the job done ourselves. “And it was as good a goal as we’ve scored all year. The build-up play, the quality of the ball in. The wideman coming off the full-back. You can practice them in training but they rarely come off. Six successive defeats early in the season left Brakes marooned in the bottom three but Holleran never gave up hope and after a campaign he admitted has proved mentally draining, he is now able to enjoy the final week of the campaign ahead of the visit of Salford City. “It’s the first week out of a 40-week season that we haven’t been fighting relegation. We’d not been out of a relegation battle from week one. It’s difficult for a manager. You’ve got different emotions and different characters to deal with and you’ve got to keep telling them to keep believing and working hard. Salford arrival at the Phillips 66 Community Stadium as newly crowned champions and with both sides having something to celebrate, Holleran is predicting a memorable day, both on and off the pitch. “They’re coming down in great numbers. A lot of neutrals will be interested in the game. “They have achieved what they set out to do at the start of the season and we have achieved what we set out to do - both clubs have done well.